(The Gospel first came to the northern English in 627, When King Edwin of Northumbria was converted by a mission from Canterbury (51:17 N 1:05 E) led by Bishop Paulinus, who established his see at York. Edwin's death in battle in 632 was followed by a severe pagan reaction. A year later, Edwin's exiled nephew Oswald gained the kingdom, and proceeded at once to restore the Christian mission. During his exile, Oswald had lived at Columba's monastery of Iona, where he had been converted and baptized. 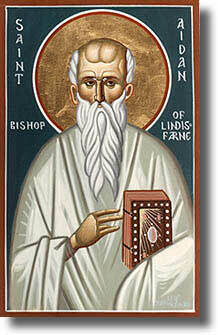 Hence he sent to Iona (56:19 N 6:25 W), rather than to Canterbury, for missionaries. The first monk to preach was a man named Corman, who had no success, and returned to Iona to complain that the Northumbrians were a savage and unteachable race. A young monk named Aidan responded, "Perhaps you were too harsh with them, and they might have responded better to a gentler approach." At this, Aidan found himself appointed to lead a second expedition to Northumbria. He centered his work, not at York, but in imitation of his home monastery, on Lindisfarne, an island off the northeast coast of England, now often called Holy Isle (55:41 N 1:48 W). With his fellow monks and the English youths whom he trained, Aidan restored Christianity in Northumbria, King Oswald often serving as his interpreter, and extended the mission through the midlands as far south as London. Aidan died at the royal town of Bamborough (Bamburgh), 31 August, 651. The historian Bede said of him: "He neither sought nor loved anything of this world, but delighted in distributing immediately to the poor whatever was given him by kings or rich men of the world. He traversed both town and country on foot, never on horseback, unless compelled by some urgent necessity. Wherever on his way he saw any, either rich or poor, he invited them, if pagans, to embrace the mystery of the faith; or if they were believers, he sought to strengthen them in their faith and stir them up by words and actions to alms and good works." O loving God, who called your servant Aidan from the peace of a cloister to re-establish the Christian mission in northern England, and gave him the gifts of gentleness, simplicity, and strength: Grant that we, following his example, may use what you have given us for the relief of human need, and may persevere in commending the saving Gospel of our Redeemer Jesus Christ; who lives and reigns with you and the Holy Spirit, one God, for ever and ever. Amen.